Whats ailing Sri Lanka ? Why we are what we are! Re: Whats ailing Sri Lanka ? Why we are what we are! He sounds having something worth for the betterment of people here; doesn't he? e) If the job doesnt' get done, their co worker will pressure them or say customers are waiting. Someone told me SL Passport office is now starting to be very efficient? Is it true ? (I have been trying to convince some of the big supermarket chains to allow auditing them by an outside entity and hitherto with no success). He is a bigger crook than most other guys we have seen hitherto. can you give reasons why you are saying he is a crook??.. I dont know about him but having an impression he is a good guy.. there may be a dark side that we dont know. කිත්සිරි ද සිල්වා wrote: He is a bigger crook than most other guys we have seen hitherto. We had a long discussion about him on another social media forum and when I said this there, many were surprised. He was brought in by MR and entered the fray on their looted money, with the intention of splitting the middle class educate Colombian votes usually go against MR clan. malanp wrote: can you give reasons why you are saying he is a crook??.. I ran a Poll on this issue on another site and I am yet to get any disagreement vote on the poll there. කිත්සිරි ද සිල්වා wrote: Spot on. කිත්සිරි ද සිල්වා wrote: We had a long discussion about him on another social media forum and when I said this there, many were surprised. Thanks SLS for highlighting all these national issues. If one looks at current trade union (including student unions) demands, one feels sorry about the future of Sri Lanka. For example, doctors demanding reduction of taxes only for themselves and cancel Singapore agreement and university students demanding their right to appear for final exams without attending lectures. We never hear of such illogical demands abroad even in less developed countries. If possible, would like you to see the poll you made based on this and read any comments by others if any? කිත්සිරි ද සිල්වා wrote: I ran a Poll on this issue on another site and I am yet to get any disagreement vote on the poll there. No comments and just Agree or Disagree. Kept it open only for 8 hours and 14 responded and all said Agree. කිත්සිරි ද සිල්වා wrote: No comments and just Agree or Disagree. Well, even if it was 5 people , it is more feedback than here right? much gratifying and more effective than spending 10 hours with 30 who DO NOT CARE. Let us do our parts without thinking of any gratification. Being able to "flaot one's own bread on water" is a real buddhist to my undersatnding. Then there are words of wisdom. Then again there is reality. There are people who do more they can for multi years. Then are are people who do less than they can do for 10 min. In my book, I honor , recognize and support one kind more than the other. කිත්සිරි ද සිල්වා wrote: Let us do our parts without thinking of any gratification. Whether one is a Lawyer , Engineer, Doctor, Clerk , Bank Officer one needs to understand they are not superior than any other person and they will rely on others at some point in life. I firmly believe no one has a right to demand perks or special privileges based on their profession more than others displaying themselves as a superior service. When it comes to Military people , Fire Fighters and any other who risks their lives to defend/save others, I do have a soft spot. I believe such people needs to be paid risk allowance and disability care due to nature of the job. I have respect for the Medical profession ( but like any other ethical profession). But am sure one can argue it is another profession just like any other , accepting payments. The effect of Medical Profession value might be more in mind due to concept of saving lives. Yes. But if someone is already paid higher than the Teacher who educate them, then lot of other questions can come into play too. do not charge them and cures people ( accepting only Thutu panduru )! 2) Talking and Analysing about Uni Students behavior .. will take pages. When Politics get into Uni's and notion of Free Education is forgotten , chaos happens. Uni Students have rights and needs. Yes. I too am all for it. But the question is, are some forgetting their Duty Vs Rights ? 3) Trade Unions . I think to fight for justice, Unions are fine. But issue starts , when Unions abuse their power and demands and dictates things . Like then 3 Wheel drivers are using /abusing Union power to resist law to add Meters to 3 Wheerlers. Why do Governments have to give in to such abuse done out of National Interest? It is obvious these people are not caring for National interest but themselves. Such Unions or People needs to be dealt with law. Unions in the power sector are the strongest in Sri Lanka. They have been able to dictate terms to all the Ministers irrespective of their party. f) stopping the recovery of losses highlighted in audit reports. ?Can a country prosper with such idiots all around covering all segments of the economy. "National Service" can help greatly to overcome such threats. Since there is no war situation, the military can be deployed to run such places (than deploying them to decorate shrines). All we need is one strong national minded leader. Sadly, none in the horizon yet. Ethical Trader wrote: Unions in the power sector are the strongest in Sri Lanka. They have been able to dictate terms to all the Ministers irrespective of their party. කිත්සිරි ද සිල්වා wrote: "National Service" can help greatly to overcome such threats. 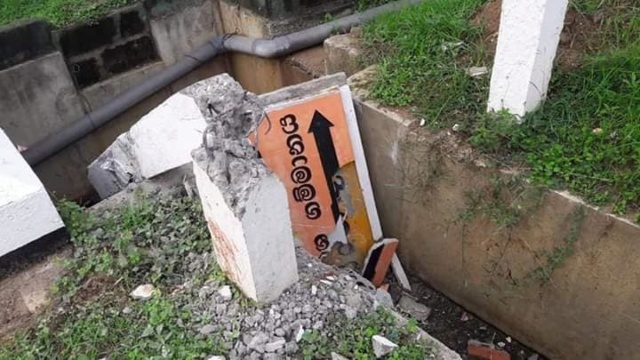 These were signs/name boards for the Housing Schemes/Villages which was supposed to be opened soon by Sajith Premadasa. They were destroyed by some people after the "PM Power change"
What ever party you belong to, do you realize this is public money, and your are hurting someones future house/village. 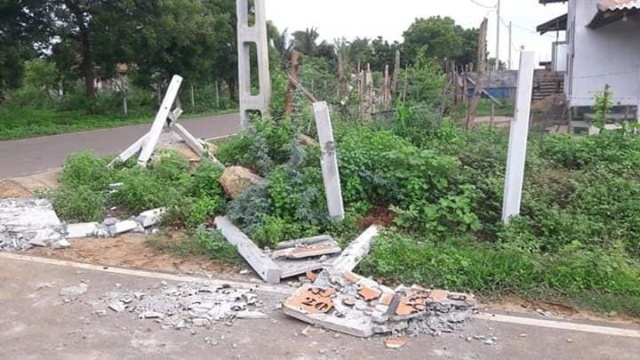 This is called VANDALISM and DESTROYING PUBLIC PROPERTY. In 99% of the countries this is act punishable by law. Will the offenders be brought to law in SL? Will the " newly appointment Prime Minister" Mahinda Rajapakse do anything about this? How many of you disagree with these acts ( even if you like MR ) ? Ashamed to be a Sri Lankan. With all these brutal happenings slaves worship the King.